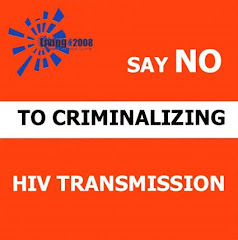 comes at critical time, just before the subject of the criminalisation of HIV exposure and transmission comes under the spotlight at the International AIDS Conference (AIDS 2010) held in Austria's capital Vienna. Mrs Seebald - whose husband, Leonhard, had been charged as co-conspirator, but who died in May – was given a ten month suspended sentence, which she is currently appealing. Her case received the full UK tabloid treatment in The Sun last Tuesday. Dr Matthew Weait, Reader in Socio-Legal Studies at Birkbeck College, London, author of Intimacy and Responsibility: The Criminalisation of HIV Transmission, and a member of the Technical Advisory Group of the recently-launched UNDP/UNAIDS Global Commission on HIV and the Law, has provided me with a thought-provoking analysis of the case that I'm posting in full below. The recent Seebald case in Austria raises a number of thorny questions for those opposed to the criminalisation of HIV exposure and transmission. These are my initial thoughts. Why do we punish? Among the reasons are to make a moral example (a retributive justification), or to deter the defendant and others (an instrumental justification). If we subscribe to a retributive justification, then the defendant needs to be morally blameworthy – not just generally, but in respect of the particular conduct they have engaged in. Such blameworthiness will typically be because they intended the harm that was committed, because they took an unjustifiable risk, or because (more rarely) they were grossly negligent. As a matter of general principle, retribution requires moral fault on the part of the defendant, in the sense that they (not some hypothetical person) knew that they were at fault and were acting wrongly. If we subscribe to a more instrumental justification – and are more concerned with the effects of a person’s conduct than with their moral fault – we may be satisfied with a criminal law that takes an objective approach. In other words, would a reasonable person have done this? Would a reasonable person have been aware of the risk? Someone who fails to take precautions against the onward transmission of HIV and / or who transmits HIV to another but who honestly believes that HIV does not cause AIDS, or who denies the relevance and / or meaning of HIV infection, cannot, according to a purely retributive approach, be legitimately punished. The honest belief negates their fault. Very few criminal law systems subscribe to such an approach, because there is always a social or public interest in harmful, or potentially harmful behaviour. More typically there needs to be a threshold moral fault, coupled with an objective (public interest) test. The question raised by the Seebald case, then, is whether a person who honestly holds a denialist position may legitimately be punished where they infect another person with HIV, or expose them to the risk of HIV infection? From a purely legal perspective, in the context of Austrian criminal law, the answer is yes. The Austrian penal code criminalises both intentional and negligent exposure and transmission. Put simply, its concern is not so much with the moral blameworthiness of the defendant as in the protection of the interests of others. There is however, a more general question as to whether the Austrian approach, and that of other countries which have similar laws, is justifiable. My own answer is no, for the following reasons. First, I believe that the criminalisation of non-intentional HIV transmission and exposure is unjustifiable on public health grounds, as well as being morally suspect. There is widespread international agreement on this point, the reasons articulated in a number of well-informed, thoughtful and coherently argued interventions. It follows that someone who honestly (even if misguidedly) denies the relationship between HIV and AIDS cannot legitimately be punished for onward transmission of HIV, unless one takes the view that such honest belief is to be ignored. And if we ignore it, then we fail to take seriously the reasons - whatever those might be – for denialism. These might be grounded in a person’s particular life story; or they might result from misinformation or misunderstanding. Whatever its cause, and however difficult it might be to understand that denialism or to sympathise with it, our incomprehension cannot be a sufficient justification for criminalisation and punishment. Put another way, a general opposition to criminalisation of non-intentional exposure and transmission cannot be displaced by conduct whose roots lie in ignorance. Doing otherwise effectively makes a failure to accept what most other people believe a sufficient justification for punishment, and that has a frighteningly totalitarian ring to it. More generally, it seems to me that the criminalisation and punishment of a denialist – apart from the immediate impact on her or his personal and domestic life – displaces the more important issues (a) of systemic failures in HIV/AIDS education, and (b) of the effects of HIV-related stigma and prejudice. If we criminalise people who hold beliefs that the majority do not share, we risk reducing larger, structural, general problems to the level of the particular, the individual and exceptional. This will get us nowhere fast, and simply provides further opportunities for human interest-driven, and scandal-hungry media to demonise and reinforce negative images of people living with HIV. We must resist the framing of events and episodes such as those represented by the Seebald case as a criminal law problem. If we do this, we necessarily imply that there is a criminal law solution – or, more strongly, that only a criminal law solution is needed. This is both wrong-headed and dangerous. The problem is far more complex, and requires a far more nuanced, sensitive and humane response – one that understands, acknowledges and addresses the reasons for a person’s denialism position rather than simply punishing them for it.